Swapping out ugly flooring or carpet in your rental unit may not be an option. But don’t worry — you can still enjoy and appreciate the flooring. How? By covering it up with area rugs, floorcloths, carpet squares, or even new, removable carpet tiles that lock together. Your new homemade flooring even protects the existing floor, and you can take it with you when you move. Everyone wins. Layered area rugs are trendy and do a great job of hiding an ugly apartment floor. They’re also perfect for hiding “problem spots,” such as stains or excessive wear on the existing floor material. Here’s how to use them. Start with one large area rug, ideally a neutral such as a large jute or sisal rug. This rug should span the conversational furniture grouping in the room. Layer another rug on the first. The top rug should have a print or pattern that goes with the furniture or decor in the room. Break style rules with the rugs. 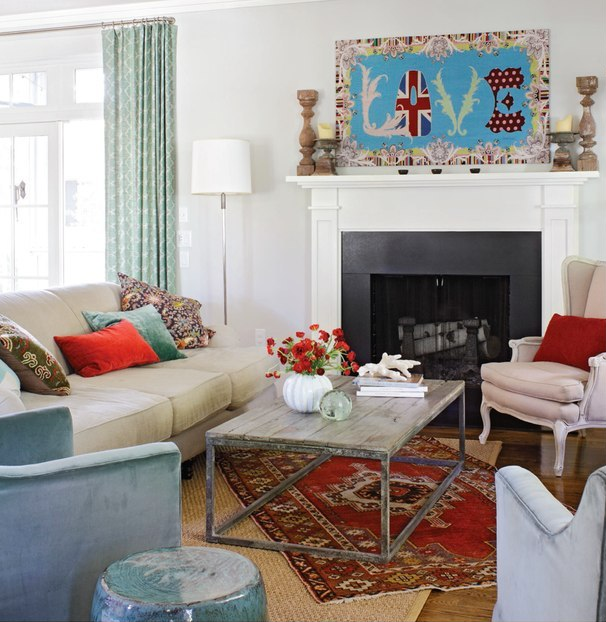 Set one rug diagonally atop or even overhanging the base rug for added visual interest. You don’t even have to hide the entire floor beneath an area rug. Just center a large rug in the room to cover most of the existing flooring. Position potted plants and large furniture around the perimeter of the room to cover up some of the exposed original floor, and you’ve solved the scary flooring situation. The beauty of a floorcloth is that it works equally well atop carpet or hard floors such as linoleum, laminate, or tile. Canvas floorcloth material is less expensive than an area rug. Plus you can customize it any way you like with regular house paint. Here’s how to make a floorcloth. Measure the room so you’ll know how much canvas you’ll need. Purchase a roll of canvas from a fabric store, or opt for a hemmed canvas drop cloth from a home improvement store. Spread the canvas out, ideally outdoors or in a garage, on a large sheet of plastic such as an inexpensive plastic drop cloth. Apply a white or tan interior latex paint base coat to the entire cloth. Plot out your design with painter’s tape or stencils. Painter’s tape can be used to make stripes or geometric shapes, while large stencils can be used for more elaborate designs. Apply another paint color between the tape strips or within the stencils to create the design. Peel the tape or taped-down stencils away once the paint dries. Tip: To make the floorcloth more durable and easier to wipe down, apply two coats of polyurethane. Snap-together carpet tiles allow you to have brand-new carpeting in your space when the landlord doesn’t want to replace the old. These tiles click together much like puzzle pieces. You can place them directly atop any kind of flooring and easily remove them later since no adhesives are used. Many carpet tiles are made to be durable enough for use in garages and high-traffic areas. Snap-together carpet tiles work best on hard surfaces and low-pile carpets. You may feel them give a bit if you place them on thick shag carpeting. Tip: You can trim the tiles to fit corners of the room. Carpet squares — those small doormat-style sample pieces — offer the perfect opportunity to make your own area rug, and for much less than the cost of a pre-made rug. You can also use scraps leftover from rolls of carpet at a carpet warehouse. Here’s how to make the rug. Purchase enough squares or scraps to make a rug large enough to cover all (or most) of the floor in the room. Arrange the squares in a visually pleasing pattern on the floor. If the pieces are all rectangles of the same size, align some vertically and some horizontally so their edges are staggered throughout the layout. Don’t worry about gaps between some squares now. You can fill them in with a cut piece of rug material later. Once you’re happy with the layout, take a picture of it with your phone (in case you rearrange the squares again and want to go back to the original design idea). Connect the pieces together by lifting the corners, and then sliding a piece of pressure-sensitive carpet seaming tape underneath adjacent edges. Run your hands over the adjacent pieces to make the tape stick. Continue taping until the entire project is pieced together. To fill the holes left in your design, slide a sheet of corrugated cardboard under your project piece to protect the floor. Slide another carpet scrap face-down beneath one of the holes in your rug. Slice it to size, using the rug hole as a template for the cut. Flip the small piece over, and use the carpet-seaming tape to secure it in place as you did with the rest of the rug. Tip: If you used mostly scrap carpeting or remnant materials to make the rug, you can add a finished edge to the rug with carpet binding tape. With your new flooring techniques, you can update every room of your apartment into a space that feels like your own.